This is a continuation of the previous post about teaching your kids about managing money. In this post, Money Management for kids we will explain some of the terms we discussed in the previous post. These are lifetime skills that will help them and even yourself in the long term. One of the most important rules is the 10% rule. Save 10% of all income, including allowances and pay checks. It is never too late to start, but if you can get them to begin as children and follow this rule into adulthood, they will be financially well off by the time they are in middle age, barring other unforeseen emergencies and lifestyle issues. This is one of the single most important guideline money management for kids that your kids and even yourself can follow. Pay an allowance – and teach them what they can do with the allowance they receive. Many will want to spend it immediately, however the power of saving for a goal is a major lifestyle achievement. Assign age appropriate tasks tied to their allowance – money received that is not tied to some kind of performance teaches nothing. Real life ties work, performance and pay checks. They might as well learn now, even if it is just taking out the garbage. Open a savings account to teach about saving – watching their money grow through savings is a powerful tool. While they will collect little interest on their savings at this time, watching their balance grow is still an important lesson. Establish emergency savings – everyone needs to have emergency savings. You never know when you need some money for health issues, major repairs etc. Establish goal oriented savings accounts – saving for a new bicycle, trip, car, education or many other items is a great way to establish goals and save towards them. Young adults should start saving for retirement – most people think that retirement is too far away to worry about, however if you start saving early, it takes the pressure to keep working later in life instead of retiring on your own terms. Learn the power of compounding interest rates and income – tied to saving early for retirement, with proper investment, savings can morph into a large number if all income is reinvested – interest, dividends etc. Older teens should obtain a credit card to learn about credit, debt and credit ratings – focus on repaying the balance every month to avoid the high interest rates charged on overdue balances. It also helps to establish a credit rating. Start saving for a down payment on a home – if you want to purchase a home, the minimum amount you will need is 10% of the value of the home. Some lenders will want to see 15% or even 20%. The more you have as a down payment, the lower your monthly payments will be. Learn about debt ratios and the 35% rule – most lenders will tell you to never allow your monthly debt payments and living costs (rent , mortgage payments) to be above 35% of your monthly income. This is the maximum for most people to ensure that they have sufficient spending money for utilities, food and clothing. That is it for this post, stay tuned for more money management posts. For more posts about life style issues, click here. This entry was posted in Fin Independence and tagged Kids and Money on 2016/09/21 by ernie. Teaching your kids about managing money can be among the most important life skills that parents can teach their kids. If you can avoid debt problems and save for things you want as well as retirement, you should have a pretty good life. At least financially. It is never too late to begin teaching your kids about managing money. Even pre-teens, young adults and even older adults can benefit. 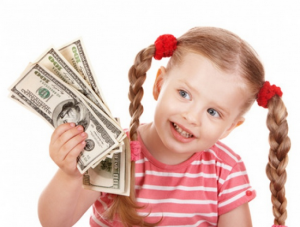 So what are the things you should do to help people and kids start learning about money? How to manage money and how to avoid getting into problems later in life over money? We will expand on this list. We will also xplain some of the items in our next post about teaching your kids about how to manage money. For more posts about life style issues, click here. This entry was posted in Fin Independence and tagged Kids and Money on 2016/07/07 by ernie.